George Washington is all bundled up in Brooklyn. I made this discovery during a recent excursion through Williamsburg, while I looked for new spots to take snapshots of the New York skyline. As I parked on a street near the foot of the Williamsburg Bridge, I spotted a patina likeness of our first president emerge from some trees. 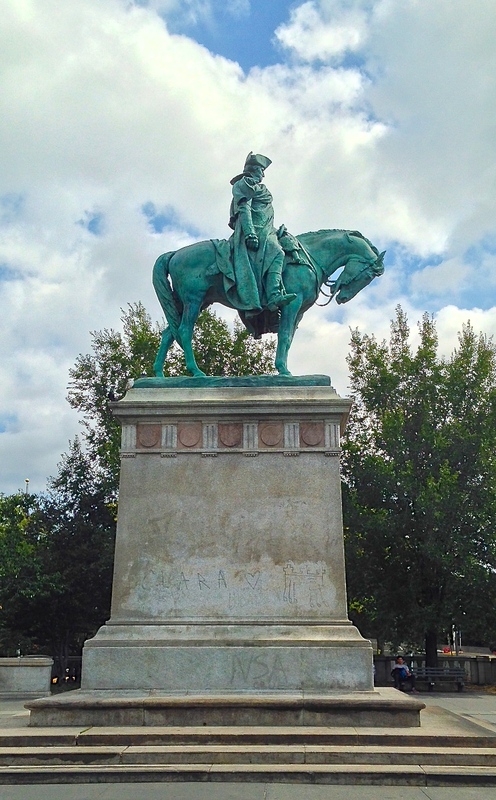 I approached the equestrian statue in Continental Army Plaza and initially noticed Washington’s heavy cloak, wrapped across his chest and shoulders. This feature was fully understood once I noticed the words “Valley Forge” engraved on the statue’s granite base. I’m forever on the lookout for great outdoor art, and this statue, a monument known as George Washington at Valley Forge, was my great find of my long day driving around the boroughs. During the Revolutionary War, Valley Forge was a military encampment in Pennsylvania where Washington, as commander in chief of the Continental Army, battled the brutal winter of 1777-1778. “Though the winter took a terrible toll, with an estimated one fourth of the 10,000 soldiers perishing, the army left in the spring intact, largely due to Washington’s capacity as a leader,” reads a page about the monument and plaza on the New York City Department of Parks & Recreation website. In this statue sculpted by Henry Mervin Shrady (1871-1922) that was dedicated in 1906, Washington is mounted on a horse and peers off into the distance, appearing confident but concerned. The horse stands still with its head way down. All of these selective touches remind us of the harsh conditions they faced. I had eagerly mentioned to Dianne Durante, an art writer who published a book Outdoor Monuments of Manhattan and produces a related website Forgotten Delights, that I had come across this statue for the first time. She too compared it to the monument of Washington in Union Square that portraits his triumphant return to New York after defeating the British. “What's especially interesting,” Durante wrote me on Facebook, “is that the horse looks so much gaunter than the one [Washington] rides at Union Square, which you'd expect during the winter at Valley Forge, right? Except that I didn't until I saw that one." No matter how the monument in Williamsburg compares to dedicated to Washington, I’ll be sure to revisit Continental Plaza to contemplate this simple but wonderful work of art, as well as recapture it from new and different angles and lighting, sometime soon.